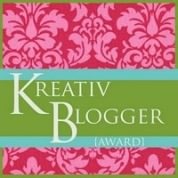 Many thanks and a bunch of metaphorical flowers to the delightful blogger at Somersaulting through Life, who has nominated me for a Kreativ Blogger award. Somersaulting TL is a fascinating blog. I hope my lovely readers will follow the link and enjoy. There are a few rules to follow to qualify for the award. Details can be found here http://somersaultingthroughlife.wordpress.com/2012/04/20/for-all-of-you-delightful-readers/ . After thanking the person who nominated, I have to nominate six more and let them know, and tell everyone ten things about myself. The Mad Hatter for his appreciation of the crazy and funny in literature. Two Gallants who have a selection of pictures and some lovely writing. D F Barker – Restless Art who gives us poems and beautiful paintings. Letters from a Briton where there is a lot of good stuff about the pagan world. Farm Lane Book blog for a variety of informative and well thought out reviews. Lizzy’s Literary Life with reviews and comments on a reader’s life. The seven ‘about’ things I gave a few posts ago still stand: I love gardening, travelling by train, the theatre, classical music and Japanese food. I do a lot of walking, and quite a lot of cooking. I can add that I belong to a book group, which I find really stimulating, go swimming in the summer and enjoy exhibitions, fairs and similar events. Thank you for the kind words. It is good to know that my work is appreciated. You’re very welcome. You deserve it.